The children in Mrs. Silva’s class are working on a project about community helpers, guided by the question, “Who are the community helpers in our neighborhood?” At the beginning of the project, the children take a walk through their neighborhood and spot a fire station around the corner from their school building. After e-mailing the Fire Department, the children have had a visit from firefighter Jim, who talked to them about working at the fire station. The children were especially interested in learning about the sirens on the top of fire trucks and the purpose of fire hydrants, so firefighter Jim focused on these things during his visit. As a follow up to the visit from firefighter Jim, Mr. Chung checked out several nonfiction books about firefighting from the school library and a few other local libraries. He placed these books in the book center; children had a chance to look at them during center time. Periodically, he or Mrs. Silva have joined the book center and read a few of the books aloud to the children. By now, many of the children are familiar with the texts and pictures in the small collection of books. Throughout the school year, Mrs. Silva has been working with the children on the concepts of same/alike and different/not alike. Children will draw upon their knowledge of this concept during the activity. 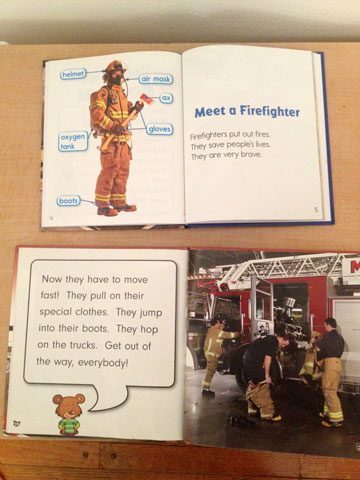 Mrs. Silva plans to use the nonfiction books about firefighters in a small group lesson to help children identify basic similarities and differences in pictures and information found in two texts on the same topic. We will show how Mrs. Silva and Mr. Chung facilitate this activity while integrating the targeted benchmark. Using nonfiction books about firefighting, Mr. Chung will lead a small group activity to help children identify basic similarities and differences in pictures and information found in two texts on the same topic. Mr. Chung will focus on similarities and differences related to the roles of firefighters and pictures of firefighters and their equipment. A small group of 4–5 children meet at a table during center time. Mr. Chung asks Reggie to go to the book center and retrieve What Happens at a Firehouse? and A Day with Firefighters. Mr. Chung knows from prior experience working with Reggie that he can identify both of these books by title. For different children at subsequent small groups, Mr. Chung can phrase his request in a different way, targeting individual children’s skill level (e.g., “Get the two books on the top shelf.” or “Get the book with the red and green fire trucks on the cover and the book with the Weekly Reader Buddy on the cover.”). Mr. Chung introduces the lesson. Mr. Chung: Today we are going to look at two books about firefighters and identify similarities and differences. That means we are going to talk about the things that are the same and the things that are different about each book. Mr. Chung encourages children to review their knowledge about firefighters before he reads the books. He guides children with questions and prompts to help them describe things that are needed to perform a firefighter’s job. Mr. Chung: Kate, tell us what you know about a firefighter’s job.Kate: Firefighters have to wear special clothing to keep them safe in a fire.Mr. Chung: That’s right! Noah, what can you tell us?Noah: They have to sleep at the fire station to be ready for the fire. Mr. Chung reads both books aloud to the children. Knowing the aspects of similarities and differences he will highlight during the discussion, he prompts children to pay attention to particular features in the book. Mr. Chung: I am going to read two books about firefighters to you. 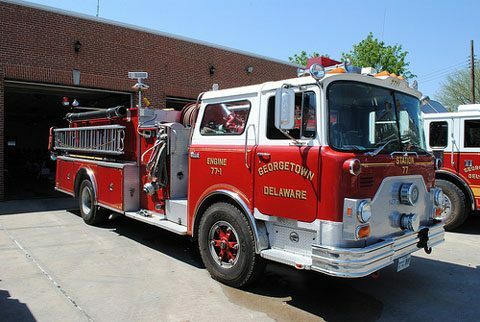 Pay close attention; look and listen for information about boots, trucks, ladders, and hoses. As Mr. Chung reads the books aloud, he occasionally highlights the features he has asked children to notice (e.g., “Oh, that page had information about boots. Let’s try to remember that for later.”). After reading both books, Mr. Chung leads a discussion about similarities and differences between the texts, focusing on one aspect of the books at a time. He guides the children with questions and prompts, helping them engage with the materials as much as possible. Mr. Chung: Today, we planned to notice similarities and differences. We paid attention to boots, trucks, ladders, and hoses. First, let’s talk about boots. Kate, can you take A Day with Firefighters and find the picture of boots? Reggie, you take What Happens at a Firehouse? and find the picture of boots. Everyone else, you take a look at those pictures after Kate and Reggie have found them. Kate and Reggie locate the pictures of boots in each book. Mr. Chung: All right. Let’s take a close look at those pictures. What do you notice that is the same about them?Noah: The boots in both books look very heavy!Kate: Yeah! And the firefighters’ pants cover up their boots.Mr. Chung: Those are great answers. What do you notice that is different?Reggie: In this book, the firefighter is standing still so we can see all of his clothing labeled, but in this book the firefighters are moving around in their boots. Mr. Chung repeats this process with the other topics: trucks, ladders, and hoses. 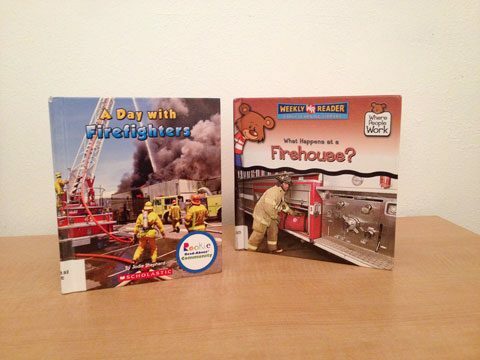 For some of the topics, information in the two texts may be very similar and children may mainly notice how the two books are alike (e.g., both books have red fire trucks, both books have fire trucks with sirens on top). 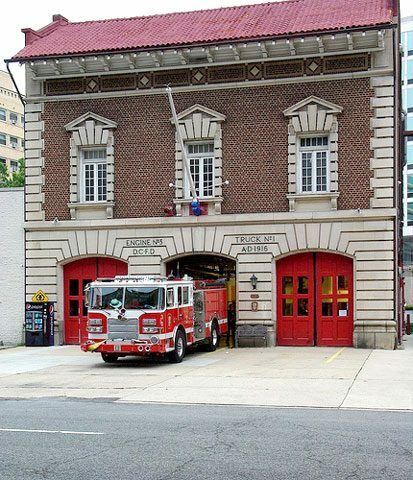 In other examples, children may only notice differences (e.g., A Day with Firefighters includes information about ladders, but What Happens at a Firehouse? does not include any information about ladders). Mr. Chung may more easily facilitate this activity by preparing in advance. Before the small group, he reads both books and jots down page numbers for each of the main topics of discussion. 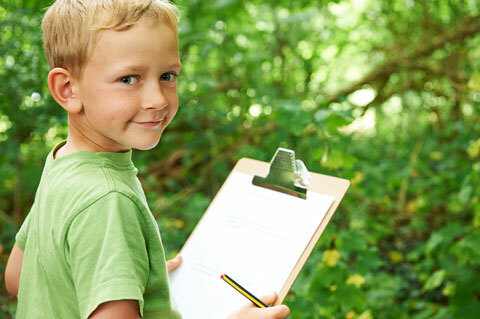 He also makes a short list of similarities and differences that he can refer to if children need help getting started. He may use a small “sticky note” to mark pages he wants to highlight for the children. As Mr. Chung leads a discussion of similarities and differences, he embeds relevant questions and comments to help children focus on what is needed for firefighters to do their job (e.g., “These firefighters have to wear boots to protect their feet. Firefighters need to keep their whole body protected so it is safe for them to enter the fire.”). Mr. Chung has a simple evaluation sheet that he completes as children participate in this activity. On this sheet, he indicates whether each child was able to identify a similarity and difference; he also records children’s comments. Mrs. Silva and Mr. Chung review the evaluation sheets at their next planning meeting. They identify the children who could benefit from additional activities related to identifying similarities and differences and plan accordingly. Mrs. Silva finds a second local fire department and takes a picture of that fire station, in addition to the fire station near the school. She enlarges both pictures and asks children to identify similarities (e.g., both fire stations have red fire trucks) and differences (e.g., the first fire station is a one-story building, the second fire station has two stories). This lesson was written in the context of Ms. Silva’s preschool classroom. We now offer some general suggestions for adaptations that you can use in your own classroom. Child is able to use simple vocabulary and pointing to identify the objects highlighted in the lesson (e.g., boots, truck, ladder, hose) but is unable to identify whether objects are the same or different. Teacher adjusts the activity so the child is responsible for finding pictures of similar objects/different objects in each book. For example, the teacher finds a picture of boots in What Happens in the Firehouse? and asks the child to find a picture of the same object (boots) in A Day with Firefighters. The teacher uses simple sentences to highlight the concept of “same” (e.g., “You found boots in this book and boots in that book—two pairs of boots. You found the same object in each book!). Child has receptive understanding of directions (e.g., describes similarities and differences about the books when asked) but uses a combination of English and his home language to express his answer. Teacher validates and encourages child’s use of home language (e.g., “Thanks for showing us something that is the same about these two books”). She also models simple sentences about similarities and differences to the child in English (e.g., “This hose is spraying water, and that hose is all rolled up. These hoses are different.”). The teacher also uses the Spanish word for some key vocabulary items (e.g., “botas is the word for boots”). Children who are learning a second language need to learn the key vocabulary words in both languages. Child has advanced verbal skills but has trouble staying on task. During the activity, this child interrupts other children as they are identifying similarities and differences. He also becomes defensive and argues with other children when they share ideas with the group (e.g. “You said the boots are the same because they are both heavy, but those boots are brown and those boots are black so really they are different!”). This often makes the other children upset. Teacher talks with the child before the large group lesson, reminding him to talk during his turn and to wait quietly while other children are having a turn. Teacher uses a visual script card to encourage child to respond to his peers with kind and encouraging words, helping him build better relationships. Before the lesson, she reviews the visual script with the child so that he is prepared to respond kindly to peers during the activity. Teacher faces the child whenever she gives instructions to the group or to this child. She encourages peers to do the same. Child enjoys the activity and participates successfully when she gets a chance to hold one of the books, but she gets upset when it is time to pass her book to a peer. She yells and holds onto the book. After she does pass the book to a peer, she stomps away from the table and starts to play in another area. Teacher uses preventative strategies with child, preparing her for the activity by explaining what is expected during the activity (e.g., “During this activity, everyone will have a turn to hold both of the books. Sometimes you will be holding a book, and sometimes you will be looking at a book that your friend is holding.”). During the activity, the teacher uses a timer (preferably one that is very easy for preschoolers to read rather than one with a digital screen) to show the child when it is her turn to hold a book and when it is her turn to let classmates hold the books. Conducting the activity with a very small group (3–4 children) so that the child has more frequent turns holding the book. 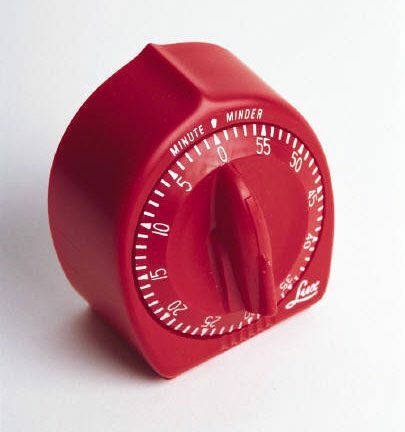 Setting the timer for very short increments of time (reducing wait time). Verbally encouraging the child during wait times (e.g., “I can tell you want a turn with the book because you are staying at the table. When you stay at the table you get a turn with the book.”).